SUM 41: 13 Voices Bio Multiplatinum rock outfit Sum 41 wrapped its final tour supporting 2011’s Screaming Bloody Murder in April 2013. It was one of the band’s longest and most attended touring cycles in its 20 year career, and they found themselves nominated for a Grammy for the first time ever. However things were not as perfect as they seemed, as vocalist, guitarist, and producer Deryck Whibley found himself on the brink of destruction. “I can’t pin-point one exact moment that put me over the edge, it was more of an accumulation of many things when I slipped into a fog of partying and booze. I tried to detach myself from any and all responsibility whatsoever,” Whibley reflects. He spent the next year doing just that, and at the end found himself in a Los Angeles hospital fighting for his life. Whibley spent most of April and May 2014 in and out of the ICU with his mother and fiancée by his side. When he was finally released as an outpatient he realized that his journey was just beginning, and it was then that he began to write while simultaneously going through intense physical therapy. “Being sober and out of the fog made me realize that the only things I really cared about were music, making a record, and getting better so I could get back on stage again.” The music came together in tandem with Whibley’s health; he recalls: “Due to neuropathy, muscle atrophy and medication that caused permanent nerve damage in my legs and feet left me unable to walk and in excruciating pain for months. I had to learn how to do everything again—my motor skills, learning how to play guitar. It was really difficult, but at the same time if I didn’t have a record to make, I don’t think I would have recovered as quickly, or even at all.” He continues, “Writing music gave me a purpose and I started from scratch with absolutely nothing to work with. I would put on movies with no sound and start writing guitar riffs and music to the images. Mostly movies from Tim Burton and Quentin Tarantino like Edward Scissorhands, Sweeny Todd, Kill Bill and Inglorious Bastards. The process led me in a direction that I had never gone in before which made me feel like I was writing a theatrical score called “hard-score punk”. Soon, he was gathering his bandmates at his home in Los Angeles to begin laying down tracks for what would become the group’s sixth full-length album, 13 Voices. The record includes a surprise return from original guitarist Dave Brownsound, who parted ways with the band a decade prior. The first song Dave played guitar on was “Goddamn I’m Dead Again” a track that proves that the fiery guitar riffs that came to define SUM 41 are back. In addition to bassist Cone McCaslin and lead guitarist Tom Thacker, Sum 41 would also formally welcome Frank Zummo (Street Drum Corps, Krewella, Thenewno2, Dead By Sunrise) behind the kit. Whibley produced and engineered 13 Voices entirely on his own in his house. Drums were set up in the living room, guitar amps in the bedrooms. The end result stands tall as SUM 41’s most intense, cathartic and all-around finest work in years. The album was written from a place of optimism, and speaks to the necessity of Whibley’s drastic fall before he was able to rise again. Opener “A Murder Of Crows,” the first track written upon the frontman’s release from the hospital, is about how those closest to Whibley quickly abandoned him when things got bad. The song’s haunting refrain (“You’re all dead to me”), repeated over bombastic percussion and steadily building guitars, is Whibley’s rallying cry; he’s letting go of the past in order to salvage his future. He touches upon the theme of letting go further in “Fake My Own Death,” the fan track being released first from the record. “I just wanted to get away from everything that I had been doing. 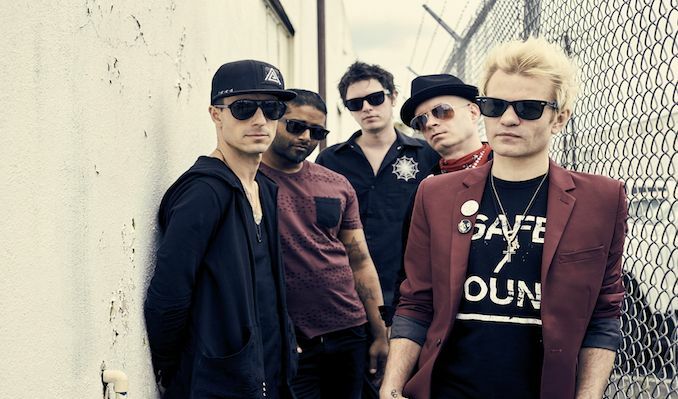 I needed to start a new life—like faking my own death.” With the upcoming release of this album we see SUM 41 as an impenetrable unit putting everything they’ve got out into 13 Voices. The result is a dynamic, impassioned collection of melodic, guitar wielding, rock songs. “I can’t say whether this is our best record or not, as I don’t know if it is,” states Whibley. “All I can say is I did the best I possibly could during the toughest period of my life”.